For today's installment of #FridayFlorals, we thought we'd take a different tack and showcase floral wedding gowns, an alternative for the bride who isn't too keen on white or is planning an exquisite garden wedding. Many bridal designers have been showcasing some truly stunning floral gowns this season inclusing the incredible Carolina Herrera with a focus on soft, pastel tones and soft, subtle watercolour prints. 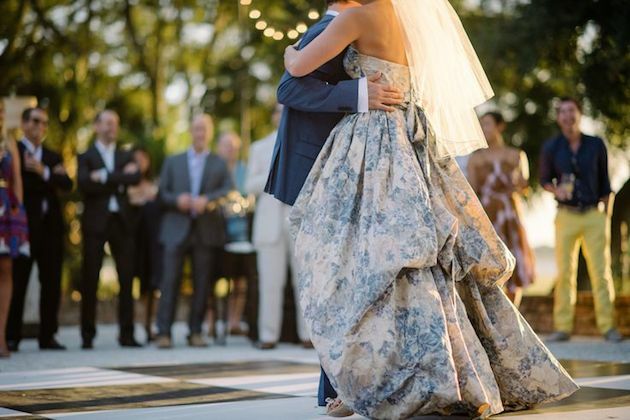 Some have chosen a slightly different route and have incorporated your 'something blue' by opting for a chinoiserie style print either as the main focus or as an underlay on the skirt so you catch a glimpse as the bride walks the aisle. The benefit of choosing a floral gown is that you'll not only stand out among a sea of white and have a truly unique gown but you'll also likely save a pretty penny considering you don't need to limit yourself to bridal collections. Many eventwear stockists may have just what you need or alternatively, you can take a bridal pattern to a dressmaker to have your perfect gown crafted out of your chosen fabric - which will be dramatically less expensive than anything in the realm of bridal fabrics. You can also usually get away with calling it a 'ballgown' and not having the added 'bridal' markup added to your creation. Floral gowns can still be paired with traditional veils so aren't a complete escape from the classic bride yet do allow you far more options in regards to accessories and bridesmaid attire. Perfect for the unconventional bride!